The Chandipath is divided into three sections – charitras – each being equivalent to one of the three Veda-s: Rig, Sama, Yajur. The 3rd Charitra is the domain of Maharasraswati, and has given rise to some of the greatest theological and metaphorical interpretations of Shakta doctrine. The Bija of this section is Klim, which is representative of the Ananda aspect of Saccidananda. That of course takes nothing away from the battle stories, where we find some of the most terrifying forms of Devi appearing. Because maybe, constant Ananda is the toughest of all things to attain and needs the intervention of the most powerful Shakti-s and the deadliest battles. The story continues at a different time when once again the asuras seize what is rightfully the sovereignty of the gods. The biggest asura-s now are the brothers Sumbha and Nisumbha. These two are seldom mentioned in Sanskrit literature before the appearance of the Devi Mahatyam and never in such details. A passage in the Harivamsa identifies these two as demons who lived in mountains, and who were slain by the goddess *Nidra Vindhyavasini*. Dispossessed and driven out of heaven the gods recall the promise that Devi made when slaying Mahisasura and so they gather in the Himalayas to request her intervention, again. The gods appeal to her as *Visnumaya*, a term which from the standpoint of Vaishnava Tantras mean the power of Visnu. This however is not how the Devi Mahatyam uses it. It is closely related to the first chapter where the Devi is addressed as Yoganidra, (hence the name Nidra Vidyavashini) employed to denote her supreme power, for it was this goddess, also closely associated with Vindyavasini as see in this section of the text, who settled over Vishnu’s eyes as his meditative sleep. From the Sakta standpoint, therefore, Visnumaya is one who can subject even Visnu to her power. Here we also encounter the famed #Aparajitastuti – Hymn to the invincible Goddess – referencing her immanence, and praising the formless abstraction of supreme power down to various manifestations of that power in our world. This is the only hymn in the text which addresses the Goddess in the third person, perhaps with the intention of impressing upon readers her awe-inspiring majesty. Further, each line of the hymn has a triple salutation, “namastasyai”, each for one of the three planes of existence – karan jagat, sukshma jagat and sthula jagat. Infact the Vaikritika Rahasya mentions that the Aparajita Stuti is addressed specifically to the most supreme form of the Divine Mother that contains all the three gunas simultaneously. To that Devi who abides in everything in the form of visnumaya, Salutations to Her, Salutations to Her, Salutations to Her, Salutations again and again. To that Devi who abides in everything in the form of consciousness, Salutations to Her, Salutations to Her, Salutations to Her, Salutations again and again. 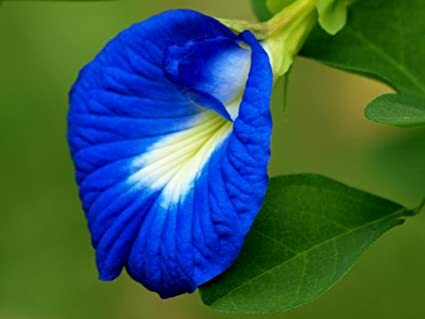 The Aparajita flower is a very important element in certain Shakta rituals. To that Devi who abides in everything in the form of intelligence, Salutations to Her, Salutations to Her, Salutations to Her, Salutations again and again. To that Devi who abides in everything in the form of sleep, Salutations to Her, Salutations to Her, Salutations to Her, Salutations again and again..
To that Devi who abides in everything in the form of hunger, Salutations to Her, Salutations to Her, Salutations to Her, Salutations again and again. To that Devi who abiding in everything in the form of shadow, Salutations to Her, Salutations to Her, Salutations to Her, Salutations again and again. To that Devi who abides in everything in the form of power, Salutations to Her, Salutations to Her, Salutations to Her, Salutations again and again. To that Devi who abides in everything in the form of thirst, Salutations to Her, Salutations to Her, Salutations to Her, Salutations again and again. To that Devi who abides in everything in the form of forbearance, Salutations to Her, Salutations to Her, Salutations to Her, Salutations again and again. To that Devi who abides in everything in the form of jati, Salutations to Her, Salutations to Her, Salutations to Her, Salutations again and again. To that Devi who abides in everything in the form of modesty, Salutations to Her, Salutations to Her, Salutations to Her, Salutations again and again. To that Devi who abides in everything in the form of peace, Salutations to Her, Salutations to Her, Salutations to Her, Salutations again and again. To that Devi who abides in everything in the form of reverence, Salutations to Her, Salutations to Her, Salutations to Her, Salutations again and again. To that Devi who abides in everything in the form of beauty, Salutations to Her, Salutations to Her, Salutations to Her, Salutations again and again. To that Devi who abides in everything in the form of lakshmi, Salutations to Her, Salutations to Her, Salutations to Her, Salutations again and again. To that Devi who abides in everything in the form of activity, Salutations to Her, Salutations to Her, Salutations to Her, Salutations again and again. To that Devi who abides in everything in the form of memory, Salutations to Her, Salutations to Her, Salutations to Her, Salutations again and again. To that Devi who abides in everything in the form of compassion, Salutations to Her, Salutations to Her, Salutations to Her, Salutations again and again. To that Devi who abides in everything in the form of satisfaction, Salutations to Her, Salutations to Her, Salutations to Her, Salutations again and again. To that Devi who abides in everything in the form of mother, Salutations to Her, Salutations to Her, Salutations to Her, Salutations again and again. To that Devi who abides in everything in the form of mistakes, Salutations to Her, Salutations to Her, Salutations to Her, Salutations again and again.